Today is the feast of Saint Lucy, a Diocletian martyr and one of Christendom’s best beloved saints. 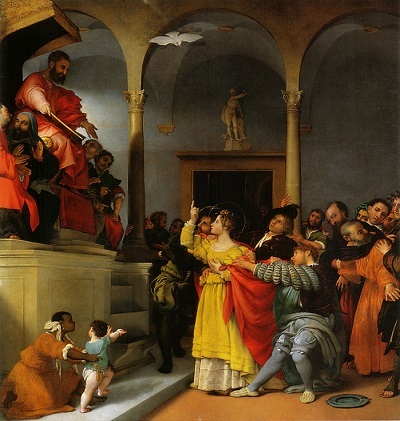 Lucy Before the Judge by Lorenzo Lotto, 1523-32. 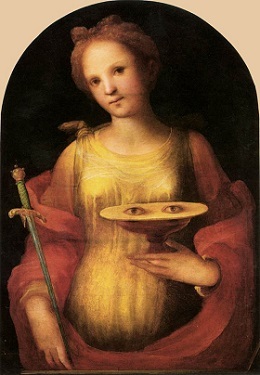 Iconography often depicts St. Lucy brandishing her own eyeballs, like a Guillermo del Toro monster: this, too, is an allusion to the torments of the Romans, and the story is either the cause or the consequence of her patronage of the blind. Lucy’s name derives from the Latin root for “light”, and her December 13 feast formerly coincided with the winter solstice; as a result, St. Lucy’s Day became a major holiday some locales — including Italy, Scandinavia, the Philippines, and Omaha, Nebraska. The English poet John Donne meditates upon the occasion in a 1627 noctural, by which time December 13 was not technically the solstice by either Julian or Gregorian calendars. 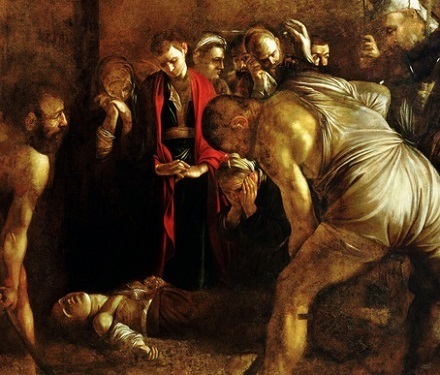 Detail view (click for the full image) of Burial of St. Lucy — which was painted for the church in Syracuse that stands on the spot of her purported martyrdom by the fugitive genius Caravaggio.